The Laron Law on general disability allowances (GDA) and conditions of eligibility, otherwise known as Amendment 109 to the National Insurance Institute (NII), came into effect in 2009. It was designed to encourage GDA recipients to integrate into, or expand, their participation in employment. Yet five years after the amendment took effect, the employment rate of GDA recipients had not risen significantly. As a result, the NII and Myers-JDC-Brookdale Institute (MJB) conducted a joint study to investigate the possible reasons. The study was presented at a seminar hosted by MJB on October 30, 2017. It was attended by some 100 professionals providing social and employment services to people with disabilities, representatives of the ministries concerned, and scholars from relevant multi-disciplinary areas. 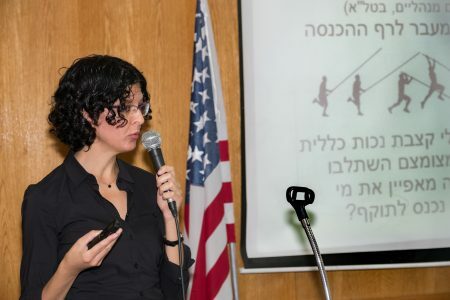 The study was presented by MJB researcher Dafna Haran of the Center for Research on Disabilities, who coordinated the study together with then center director Denise Naon. Two groups of recipients were examined – those with work experience, and those without, prior to receiving the allowance. It was found that following the Laron Law, the factors relating to integration into employment depended on whether or not the recipients had had prior work experience. For example, for the non-experienced, participation in occupational rehabilitation raised their chances of finding work; for those with work experience, being diagnosed with learning disabilities lowered their chances of working. In both groups, subjective norms exerted considerable influence; i.e., the perception of beneficiaries that their significant others expected them to work raised the chances of their actually working. Finally, only about a third of the respondents reported that they were familiar with the Laron Law, let alone understanding its practical implications. Following Haran’s presentation, center director Dori Rivkin moderated a panel of experts in discussing the Law’s implications and the contribution to the topic of MJB and NII’s study. 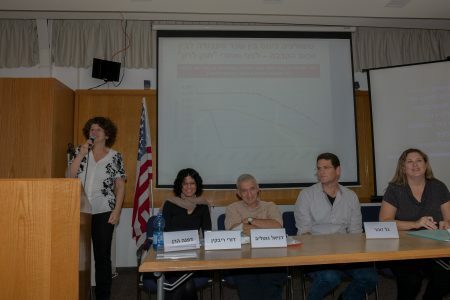 Panel members included Prof. Daniel Gottlieb, Deputy Director General of Research and Planning at NII; Gal Zohar, Ph.D., Policies and Research Area Head (The Office of the Commissioner for Employment of People with Disabilities), The Histadrut-General Federation of Labour in Israel; Einat Masterman, Director – Programs for Youth and People with Special Needs of JDC-Tevet. 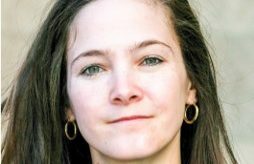 Naomi Moravia, Chairwoman of the Israeli nonprofit Struggle for People with Disabilities, was invited but did not attend for personal reasons. Alongside the specific examination of the Laron Law presented in the study, it is important to examine the Law both over time and in comparison with other countries, notably as regards the extent to which it provides incentives for employment and, on the other hand, creates dependency on the system of allowances. Certain groups of people with disabilities do not receive responses adequate for their needs under the policy of allowances in place today. For instance, recipients whose main disability is psychiatric, are generally not entitled to an allowance of special services supporting day-to-day functioning, which could thereby also help them integrate into employment. In terms of developing services for integration into employment, it is worth investing in the improvement of mechanisms to exercise one’s rights, the development of accessible vocational training, and in relating to the centrality of the family in impelling people with disabilities to go out to work. Learning disabilities are not recognized as a disability clause by the NII, yet constitute a fundamental barrier to employment integration. As regards the barriers faced by potential employees, one must consider the side of the employers as well; in the absence of law enforcement and environmental adjustments, people with disabilities will find it difficult to realize their employment potential. One conflict affecting employment-support programs is the question of the suitable training framework for integration – segregationist (specifically for people with disabilities) or integrationist (for the general public). Given the system of fragmented services and the complex needs of allowance recipients, professionals and service providers find it difficult to help people with disabilities to exercise their rights and navigate their way through the system efficiently and effectively. The seminar leveraged recognition for, and significant exposure of, MJB and its unique research work. It also provided an important opportunity for multi-professional and multi-disciplinary interaction regarding the connection between general disability benefits and integration into employment. This topic currently heads the public agenda as may be seen from the ongoing struggle of people with disabilities, the two government committees that discussed the issue, and the new outline of the agreement recently signed between the organizations of people with disabilities and the State.